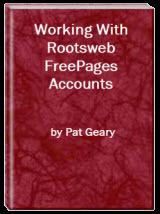 This tutorial is part of the Working With RootsWeb FreePages Accounts EBook, available in pdf format for free download. I am assuming you have already requested your webspace on the FreePages server. No, then you will need to do that first. See Request a Web Space Account. IMPORTANT NOTE: As of July 22, 2016 the link for requesting free webspace is NOT WORKING. It is not know if, or when, new accounts will be accepted. You will first need to agree to the RootsWeb Agreement for Freepages Web Space Accounts. Your Real name - both first and last. A name for your account. What you plan to use this account for. PLEASE NOTE: Your account name will become part of your URL, as in http://freepages.communityname.rootsweb.com/~acctname/. The account name must be at least 4 characters long and must consist only of lower case letters and numbers, but may not begin with a number. No spaces or characters (such as - _ / . ') are allowed. Select your account name carefully as names of accounts can NOT be changed and you may not close one account and open a new one. Your FreePages Web space at RootsWeb is ready! PLEASE READ THIS ENTIRE LETTER BEFORE YOU WRITE TO US! When you look in your directory, you'll see subdirectories called "genealogy_html", "family_html", "history_html" and so on. Upload your HTML and GIF files into whichever subdirectory relates to your pages. PLEASE NOTE: Because of our commitment to providing improvements to genealogy services, many of the community directories, such as music, arts, games, are no longer available. I have also subscribed you to the Freepages-Help-D@rootsweb.com mailing list, where all of the FreePages users at RootsWeb swap ideas. For unsubscribe instructions, please see: http://sites.rootsweb.com/help.html. If you want to place your GEDCOM file on the internet, please do NOT upload these to your Freepages account. They will work so much better if you will upload them to WorldConnect - http://worldconnect.rootsweb.com/ - as there your visitors will able to view your family and download only the portion they would like to use. GEDCOM files uploaded [to FreePages] as a .GED file may be deleted by staff at any time. Do NOT upload MP3, zip, avi, mpg, rm, ram, exe or other similar type files. You may not use your account to upload files for downloading by other users. Your FreePages account may not be used for file storage. Violation of this rule will cause your account to be deleted without warning. Make sure you keep this message in a safe place. And remember that IF you change your email, you should notify RootsWeb of the change. If not, and you lose your password, you may have a hard time getting the reminder messages for what it is. Please note that your username and password for RootsWeb.com or Ancestry.com is NOT the same as your username and password for your FreePages website. They are NOT interchangeable. To sign into your FreePages site, you must use the username and password that was included in the above email. Before you get started with working on your site, you should read Understanding YOUR FreePages Account Structure. While you can request only ONE freepages account, you actually have NINE available for your use. Now that you have received your welcoming email with your account information, where do you start. The above email does NOT give you some information you might need or find helpful in getting started. Additional information is included below. Please READ it and follow the links for more details. Since each of you will have different levels of experience and will certainly not be using the same web editor or ftp program, this information will not answer "ALL" of your questions. Before you begin willy nilly making pages and uploading files, spend some time in organizing HOW you want to setup your site. If you publish everything (images, pages, documents, etc) to one directory, you are going to be overwhelmed as your site grows and finding files becomes impossible. 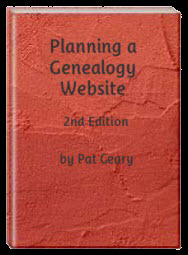 Planning a genealogy website is also available as a 20 page EBook in pdf format for you to download. It contains graphic images and clickable links as well as a table of contents. The EBook is zipped for faster download. Save it to your desktop, extract the file and it is ready to use. If your pages aren't made yet, you'll need some sort of html software as the RootsWeb online editor is no longer an option. You will probably want to look for a WYSIWYG HTML editor. With this type of editor, you work on what looks like the actual webpage, and the program writes the HTML code. Some editors do this job much better than others. WYSIWYG stands for What You See Is What You Get. For more information, see a list of some Web Authoring Software. There are a number of free editors as well as commercial ones. Download, install, and try them out until you find one that you are comfortable with and is easy to work with. If you are already familiar with writing HTML code, you can use Notepad or any plain text editor to design your pages as well as a WYSIWYG editor. FTP stands for File Transfer Protocol - This is the language used for transferring files from YOUR computer to the RootsWeb server. In order to publish your pages to your server space, you will need a ftp program. There are any number of FREE ones you can use OR you can choose to use the RootsWeb File Manager. This first page (the Home Page) becomes the portal, or entryway to your site. This becomes the URL that will lead visitors to your Freepages site. From this 'home page' you will direct people to other content via hyperlinks. You can create web pages in any of the directories available and link to them from any page. Other pages on your site can be named almost anything you want BUT they should not be overly long. IMPORTANT NOTE: File names should be all lowercase with NO spaces and NO special characters (# " & % , etc ). If you need/want to separate words, then use a hyphen to do so. This applies to ALL file names, not just your HTML pages. The file extension can be either .htm or .html. It does not matter which but try and be consistent. For a more detailed discussion on naming your pages, see Naming Web Pages by Pat Asher. Your Home Page should be uploaded/published to the root directory you are using and NOT a subfolder. If you are using the genealogy_html section then upload the file to that directory. Why? For the same reason stated above. If you upload it to a subfolder, then you cannot use the shortened url. Use the freepages mailing list to ask questions you might have along the way. There are many people of all skill levels who are willing to help you get started on this new journey. No question is too simple or dumb. And if you don't understand the answer, ask again. Remember, we were ALL beginners at one time. Both of the ebooks shown above are free. They are in pdf format so you will need a pdf viewer to read them.